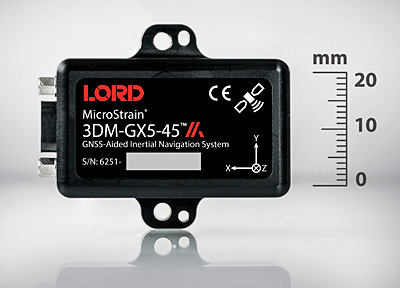 LORD Sensing MicroStrain – a global developer of embedded sensing systems – has expanded its portfolio of sensors for unmanned and autonomous vehicles for air, land, and sea with the introduction of the 3DM­GX5 family of inertial sensors. The latest generation of this award-winning inertial sensor, introduced in October, is an excellent match for measuring attitude (pitch, roll and yaw), position (latitude and longitude), and velocity in a variety of applications including antenna pointing, platform stabilisation, flight tracking, navigation and regime monitoring. The GX5-45 GNSS/INS allows a greater degree of precision by moving through terrain in 3D with a GNSS-aided navigation system when a GPS signal alone is not accurate enough. Key upgrades from the GX4 line include improved performance through in-situ heading calibration. Automatic magnetometer calibration and anomaly rejection eliminate the need for field calibration. The sensor is fully calibrated, temperature-compensated, and mathematically-aligned to an orthogonal coordinate system for highly accurate outputs. The GX5-45 features extremely stable and low­noise gyros, a new accelerometer with noise densities as low as 25μg/√Hz, a multi­constellation GNSS receiver, and M7 and M4 dual Cortex processors running a new Auto­Adaptive Extended Kalman Filter. The Kalman Filter has been proven to provide outstanding attitude accuracy, with almost negligible roll error during turns and other sudden course shifts. The sensor is easily integrated into customer systems, allowing users to quickly drop it into their existing application. It shares the same miniature footprint and API as LORD’s earlier inertial line and has the same mounting, connector and software as well as its high reliability.